Note: AICL is compiling links to reflections of the day. See the list at the bottom of this post. Last week (Friday, January 30, 2015), I was at the Day of Diversity at the American Library Association's 2015 Midwinter Conference. This is my recap of the highlights (for me) of the day. I am glad I was invited. It provided me the opportunity to meet some terrific people I've known via social media for several years. A more personal reflection of the ALA's 2015 Midwinter Conference is forthcoming. 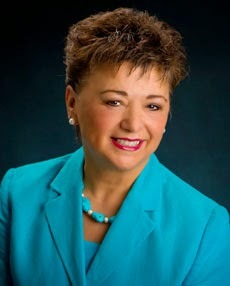 The keynote was delivered by former ALA President, Dr. Camila Alire. In her talk, Alire listed some of the problems she saw in it: the father/husband is the stereotypical depiction of violent Mexican American men with machismo, and the mother learned the right way to cook only after she went to work as a housekeeper for a white family. Roberto doesn't speak English and gets in trouble. The heroes of the story are a white policeman and a white teacher. Learning English is important in Roberto becoming the good boy of the book's title. 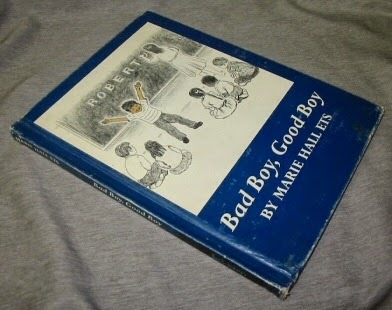 Alire analyzed Bad Boy, Good Boy using the Council on Interracial Books for Children's Ten Quick Ways to Analyze Children's Books for Racism and Bias. It failed on many points. Alire said that it is hard to find Bad Boy, Good Boy today. She said that it is important that we look for good books that accurately reflect the people being depicted, but that it is also important to talk about problematic books, too. She didn't name any present-day examples, but my colleagues have done similar analyses of Skippyjon Jones by Judy Schachner. It fails, too. See the drop from 2002 to 2013 in the American Indian column? In 2002 there were 64. In 2013, the number was 34. Last year I looked at the 34 on the 2013 list. Focusing on those published in the United States, there were 14 books. Five of them had stereotypes and/or bias such that I cannot recommend them. My point is this: we can't look only at numbers. We have to open the books and look at the content, too. At AICL, I talk about the bad in terms of that content. Far too many people do not recognize problematic content. We have to do what Alire asked us to do: talk about the bad, too. [T]he great fear I entertained of my brethren was occasioned by the many stories I had heard of their cruelty toward the whites—how they were in the habit of killing and scalping men, women, and children. But the whites did not tell me that they were in a great majority of instances the aggressors—that they had imbrued their hands in the lifeblood of my brethren, driven them from their once peaceful and happy homes—that they introduced among them the fatal and exterminating diseases of civilized life. If the whites had told me how cruel they had been to the “poor Indian,” I should have apprehended as much harm from them. These historical moments are important. After Alire's keynote, the first panel began their presentations. Leading them off was Violet Harris. The struggle, Harris noted, is not new. What is different is social media and its potential for effecting change. 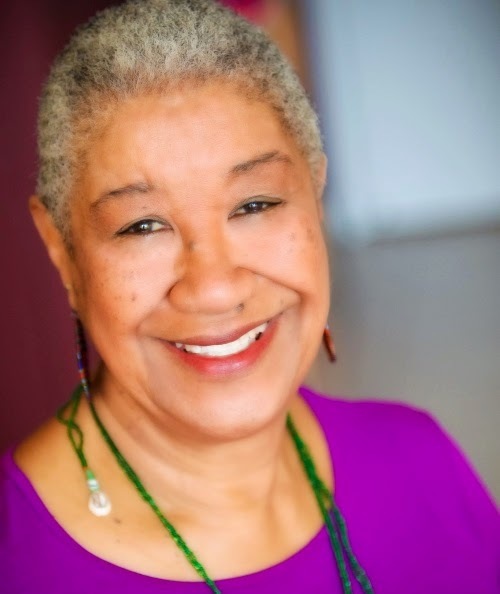 She pointed to the We Need Diverse Books campaign and to the articles Walter Dean Myers did for the New York Times. His Where Are the People of Color in Children's Books came out in March 15, 2014, but it was preceded by his "I Actually Thought We Would Revolutionize the Industry" which came out in 1986. The panel was followed by a breakout session that I found disappointing. Much later, I realized that the breakouts were geared more towards the people in the audience who are new to all of this--those who are just starting out and want to make change in what they do in their libraries. Lunchtime was a powerful hour as Sara Farizan, Ellen Oh, and Cynthia Leitich Smith did a "Lightning Talk" about their work as writers, and Namrata Tripathi spoke about her work as an editor. What made the four talks so riveting was that the four women shared personal stories from their own lives that shape the work they do. Books are not mere entertainment. They inspire us, but they can hurt us, too, and we must speak about up more about problematic books. Pointing to problems can lead to change. I'm running out of steam right now, but don't want to close this off without saying a few things about Satia Orange's closing. A former director of ALA's Office for Literacy and Outreach Services, she moderated the last panel. I'm paraphrasing and wish I had a recording so that I don't misrepresent what she said. This is a dangerous time for black and brown children, she said. More than anyone, she called out the power structures that aren't with us in this struggle. * More of us have to step up. We have to challenge publishers and do more, like selling books in non-traditional places. She challenged the gathering to do something dramatic next week, and next month, for children of color. The Day of Diversity began with a request that we call people in rather than calling them out. I understand that it is important to assume the best of people, but being nice, in its way, lets the status quo continue unchallenged. Challenging the status quo is uncomfortable for me, and it is uncomfortable to those who I challenge. Most recently, David Arnold (author of Mosquitoland) blocked me from being able to see what he tweets because I pointed to his use of "warpaint" for his "part Cherokee" character. That book is getting starred reviews. Obviously people love it and see nothing wrong with its use of "warpaint." That sort of thing affirms misinformation about Cherokee people, and it is an affront to Cherokee children and their families who are weary of being misrepresented again and again and again. 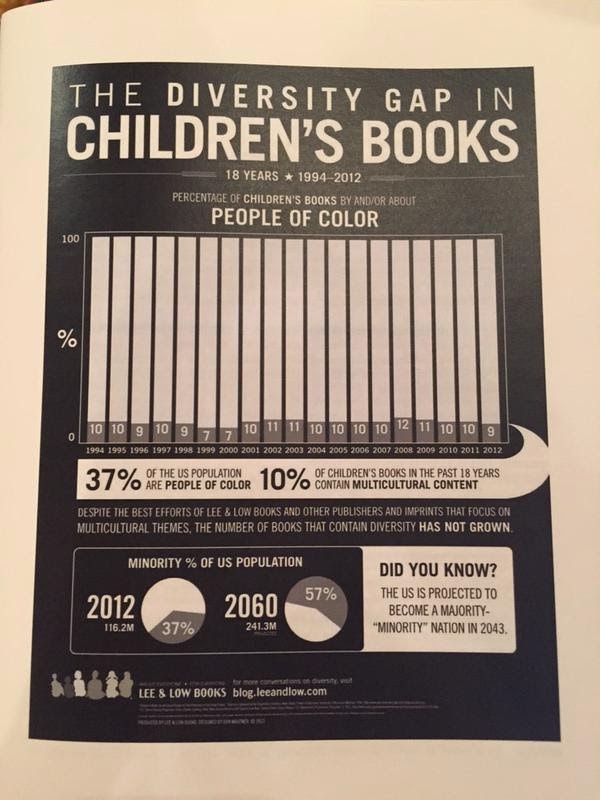 During the day, I spoke with Kathleen Horning about the work of the Council on Interracial Books for Children. She said she thinks they made a difference because they called people out. I think that is what Satia Orange is asking us to do, too. Speak up. Be dramatic. The lives of children of color matter. For more, see these personal and professional reflections. I'm adding others as I see them. Please let me know of ones you see, too. Janet Wong: How Will You Step It Up? *Edited to reflect clarifications provided to me by KT Horning in comments (below) and others who were there. Debbie, thank you for this recap! I attended the open report out yesterday at the conference, but it was brief, and it's important we hear more from participants and their takeaways so that we can carry the momentum of this conversation. A clarification of what I said, Debbie. I quoted one of my UW- Madison colleagues, Bernice Durand, Associate Vice Chancellor for Diversity and Climate, who said you need to have AT LEAST three people of color in any group in order to affect change. So when I made appointments to award committees, I followed her advice. Nina--I'll add additional perspectives/reflections as I see them. At bottom are ones from Edith Campbell and Zetta Elliott. KT--I'll make that note above in the text. My hope: that ALSC and CBC publish a transcript of the day's remarks. I am most disappointed that the Ipad they used to do recording was full and they weren't able to record Satia's comments. KT - this is what I have in mind also when I cast my votes for the various ALA media awards committees. Wxat Anushiik! (heart felt thank you) Debbie, your recap is important. I agree, being 'nice' does not effect change of any kind. Nice does not lead to confronting issues, critical thinking, meaningful dialog or change. Being direct by confronting the issues opens the door for critical thinking, dialog and change. Thank you for opening doors that confront issues and bring about meaningful change. And for yellow too! Great point about screening the books for negative stereotypes.